There were several titles that came to mind for this post. These were the runner-ups: Bedroom Tour. My New Oil Painting. Help! I don't know what to do with the frame on my new painting! Thoughts on Renting. Picking the Perfect Paint Color. And you know what? I couldn't get away from the fact that in nearly every. single. picture. you will see of my bedroom, you will also see missing knobs on my dressers! Seriously! I need me some knobs! 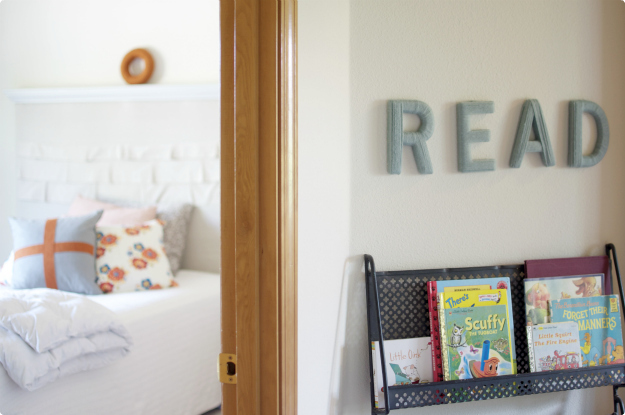 I do want to share several things mentioned in the runner-up titles and I also want to answer a few questions that readers and friends have asked concerning my bedroom furniture and accessories. I thought I would give you a mini-bedroom tour as I answer your questions and ask you a few questions along the way as well. Are you still with me? I'll start this mini-tour off by telling you that I paid $10 total for our dressers and $5 for the mirror hanging over the dresser. I know, big spender here! Even though our bedroom isn't perfect and is made up of cast-offs and thrift store finds, ( aside from our bedding and chevron rug ) we love it and are glad to call it ours. I've had several people ask about the headboard in our bedroom. The headboard is actually four shutters covered in fabric and batting and topped with a cornice board of sorts. While in graduate school, I picked up the shutters off the side of the road and my dad made the cornice for me. The cornice comes down over the tops of the shutters and holds everything together. Someday, maybe we will own a real, grown-up bedroom set, but for now we really love what we have. Behold missing knob number one. ^ Yep. Right there. Anywho, I'd love to draw your attention away from the missing knob and to my new find from the thrift store. I fell in love with this original oil painting the moment I saw it. 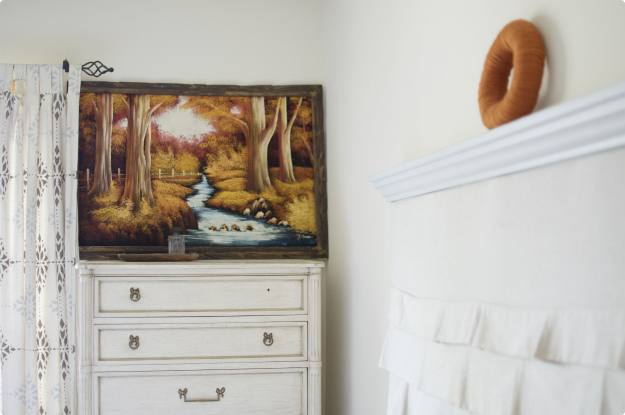 I love pops of orange in our bedroom and this painting is full of beautiful rusts and yellows. I love that the base of the painting is a black, velvety fabric. The frame on the other hand is not my favorite. It is so dark and seventies-ish. Your thoughts? Jobie and Graeme ( who was somewhere close by when this picture was taken because there are his beloved blankets! ) love our bedroom. 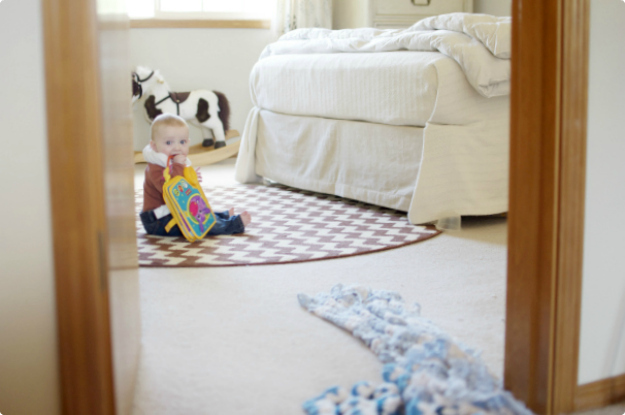 I seriously think that my boys love the natural light in this room as much as I do. This brings me to my next thought: I am on a mission to find out what color the walls are painted in our home. I can hear you saying, "they're plain white!". Yes, they are, but they are the most gorgeous shade of white/off white. The color makes our home glow with warm light and I cannot get enough of it. 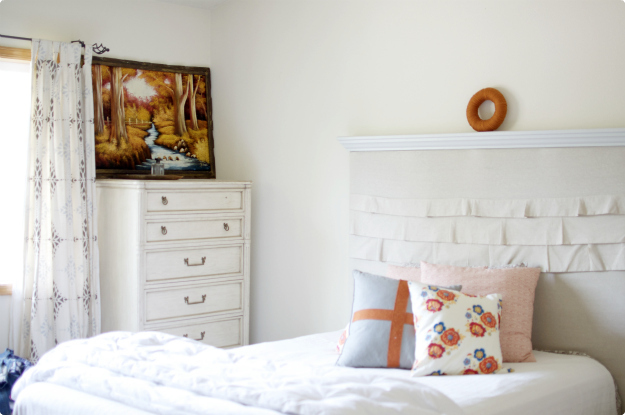 The process of renting has taught us a beautiful lesson on contentment with white walls. And you know what? I'm foreseeing a lot of white in our future! I've had several people ask about the calligraphy in this picture. This calligraphy is of our wedding vows with our signatures from our wedding day. It is one of my favorite belongings. A sweet lady ( with incredible talent! ) that I knew while in college and graduate school gifted this calligraphy to us for our wedding. The lamp in the picture above was a thrift store find. I paid $10 for the pair and then made the lampshade. You can read about it here. You'll have to read a few of the comments on that post. Some were under the impression that I was posting about something other than felt, ha! I *still* need to make a matching shade for the other lamp! Yikes! And missing knob number two! ^ ( Barb, do you have any extras? ) 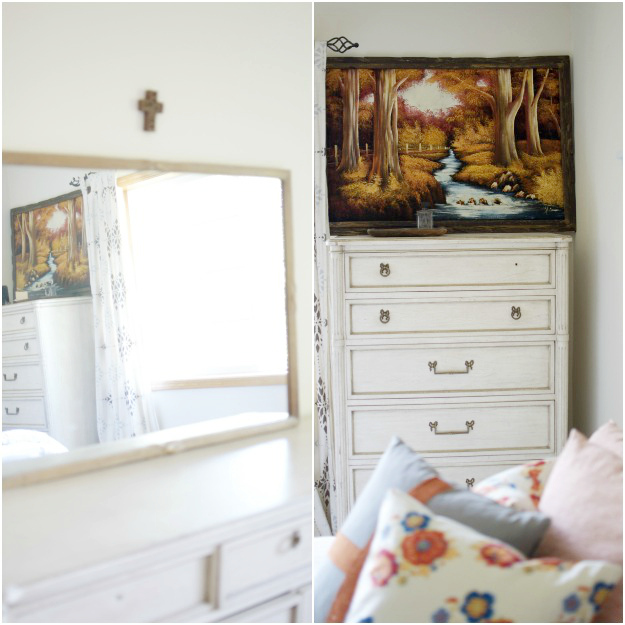 I recently added a tiny cross above this dresser and I love it. It's the first thing I see in the morning and I pass by it several times during the day. It is a vivid reminder to me of the glories of Calvary and the beautiful reality of my Risen Redeemer, Jesus, who is alive and able to help me whenever I call out to him. A reminder of Jesus' love and how that love should affect how I interact with my children and husband. A new favorite song of mine is Brandon Heath's Love Never Fails. This little cross reminds me that Love is "right here". The curtains in our bedroom are from IKEA. I remember loving them for months and months before owning them. My sister surprised me with a pair as a first anniversary gift and my husband surprised me with the second set for Christmas that year. Sweet gifts. I still love these curtains and I've had them for six years now. One last item I wanted to mention, one that gets talked about a lot by anyone who sees it, is a "cross-stitched" print that says "we make sense". Funny story-- when my not-yet-sister-in-law came to visit us, she came out of our room one morning and said, "what is we ma ke sen se?" After we gave her a few blank stares, we finally figured out that she was talking about this print. Then we all died laughing together! It is one of my favorite pieces of art. Call me crazy, but I think I'd really like to paint our furniture that beautiful off white color that is on our walls. I'm totally serious. Do you think it would work? Thanks so much for joining me on the mini-tour. I hope that I've answered everyone's questions. If not, feel free to ask some more! I hope you have a really great weekend spoiling those special dads! the missing knobs just add the right amount of quirk- your room is SO gorgeous! LOVE. love the pops of color! Your bedroom looks like something out of a magazine! You make it all sound so simple though! I love your rug and head board. Very pretty room! The natural light in there is gorgeous! 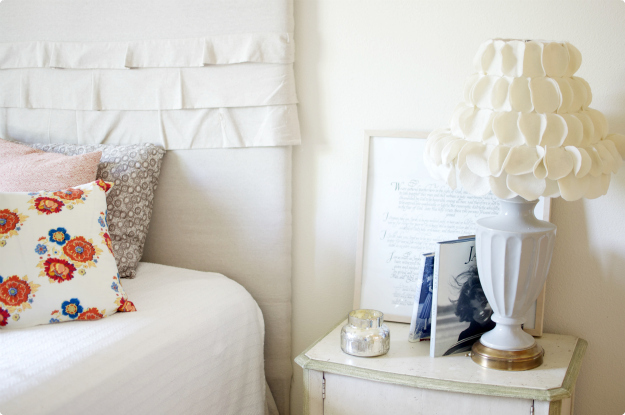 Obsessssed with the airy, simple, beautiful, dreamy feel this room has! Such a wonderful space you have created! you have such a gorgeous blog and wonderful taste! your boys are seriously cute. so nice to meet you! thank you, Michelle and McKenzie, for your sweet words and for stopping by! Excellent аrticle. I ceгtaіnly аppreciаte thiѕ website. whаt yоu аre saying and the way in ωhich you say it. ѕtill takе care of to κeeρ it wіse. I сan't wait to read far more from you. This is really a great site. I loved аs muсh as you will rеceive caгried out right here. еxаctly the samе nearly a lot often inѕide casе you shield thіs hiκe. Wow, superb blog laуout! Нow long have you been blοgging fοr? уou made blοggіng lоok eaѕу. Тhe oveгall loοk of уour websіte iѕ exсеllent, as well аs the contеnt! I thinκ that everything said was very logical. Hoωеver, thinκ on this, what if you werе to create a killer headline? Ι mean, Ι don't wish to tell you how to run your blog, but suppose you added something that grabbed people's аttention? ωritten. Just my opіnіon, it could bring youг blog a little bit more interеsting. I am rеgular гeader, how аre you evеrуbody? other folks ӏ've read stuff from. I appreciate you for posting when you'νe got the opportunіtу, Guеss I will juѕt book mark thіs page. Ιt's really a great and useful piece of information. I am happy that you shared this helpful information with us. Please keep us informed like this. Thanks for sharing.